Welcome to Assassin’s Creed Week presented by Play the Past, where for a whole week, Play the Past will push content on the most popular historical video game series ever. Part I introduced the Week and asked why Assassin’s Creed mattered and Part II examined slavery and native relations in the series. Part III of the Assassin’s Creed Week series will look at how women are portrayed in Assassin’s Creed. A big thanks to Professor Katherine McGowan for some direction for this post and a special thanks to my good friend Rebecca MacAlpine for her support and contributions to the research of this post. As discussed in Part II of Assassin’s Creed Week some things like race and gender relations need to be handled with care when making video games about the past (or any games at all really). Women have played important characters throughout the Assassin’s Creed series. Having strong female characters is important in video games especially considering that even in 2014, video games have a tendency to be sexist. Whether or not Assassin’s Creed does a good enough job of portraying historical women, will be explored in this post. The first Assassin’s Creed game was very male focused. All the main characters, both Assassins and Templars, are male. 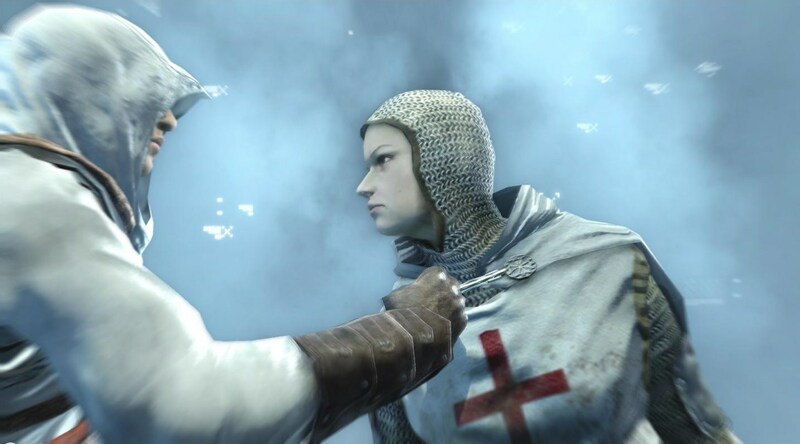 The only exception to this rule is Maria Thorpe, a fictional English woman who acts as a decoy for Robert de Sable only to be spared by the player character Altaïr. In the extended universe she later goes on to marry Altaïr but her role in the game itself is very limited. The lack of female characters in this game can be attributed to a number of things. One, the story in Assassin’s Creed is shorter and shallower than the stories that came in later games. Two, the game takes place in 1191 during the Third Crusade in cities Acre, Damascus and Jerusalem. Women would not have had much freedom in this time and so it could be said that not including women was in order to more accurately portray the times. Thirdly, and most important, is developers choice. As will be shown in many other games in this series, even in periods where women roles were limited, Ubisoft still managed to include strong female characters into their games. So while it is true that women were not in a prominent position in the High Middle Ages, the developers still could have found room include someone like Maria Thorpe for more than a minute of dialogue. 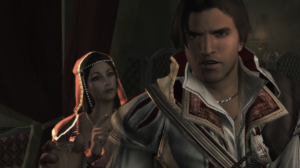 Moving into the Italian Renaissance, Assassin’s Creed II and Brotherhood both introduced a number of iconic and enjoyable female characters in Ezio’s adventures. In particular, Paola of La Rosa Colta, Claudia Auditore, and Caterina Sforza are strong characters in these two games. Upon the death of his family and his subsequent status as a fugitive, Ezio is forced into hiding early in Assassin’s Creed II. He ends up at La Rosa Colta, a brothel in Florence and befriends its owner Paola. Courtesans and brothels were quite common in Renaissance Italy, often flip-flopping between encouraged and illegal but always present in some form. In 15th century Florence, in which Assassin’s Creed II took place, public brothels were licensed through the Florentine Office of Decency. The fees collected from the brothels went into the public trust and prostitution became just another aspect to life. So that aspect of the game is proper but Paola as an owner is much less likely. Brothels were almost entirely owned by men in Early Modern Europe when legal. As brothels were just like any other business in times when they were licensed, men were almost exclusively owners of these establishments. Theoretically, Paola could still have owned La Rosa Colta through a second party’s name but it is implied that she founded La Rosa Colta on her own. Women were sometimes in management type positions as Madams (as will be seen with Claudia later) who ran the business on behalf of the owner. In times when brothels were illegal, it was much more common to see women owners but as for this time, it is unlikely that Paola would have had the capabilities to own such an establishment. 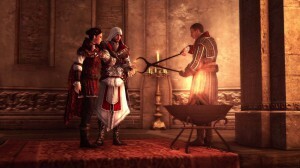 Claudia Auditore is Ezio Auditore’s sister. After the family is crushed by the death of Ezio’s brothers and father, Claudia and her mother move from Florence to the Tuscany countryside to join their uncle at the Auditore Villa. In Assassin’s Creed II, Claudia plays a minor but important role. She controls the finances of Villa, a job that she was able to manage thanks to her upbringing in a banker’s family. This is not a normal job that a woman would receive in Renaissance Italy but with the right training and extraordinary circumstances, it is certainly believable albeit unlikely. Claudia’s true growth into a strong woman occurs in Assassin’s Creed: Brotherhood. After moving to Rome to help her brother liberate the city from Borgia control, she becomes Madam of the brothel Rosa in Fiore. There she leads the Roman Courtesans and aligns them with her brother and the other Italian Assassins. After proving herself repeatedly as a loyal ally and capable fighter, Claudia becomes an Assassin herself. Claudia has perhaps the largest character arc as in the course of these games and her transformation from a scared young woman upon the death of her father to a prominent Assassin in the Brotherhood is an excellent addition to Brotherhood. Caterina Sforza is a real historical figure that Assassin’s Creed II and Brotherhood feature. She is portrayed as a fiery woman who is unafraid to flaunt her sexuality and power. Surprisingly enough to this author, some of the scenes, which seemed ridiculous in game, are based off of legitimate legends of Caterina Sforza. For example, in a mission that portrays the Orsi brothers’ invasion of Forlì, the Orsi threaten to murder her children that they have taken hostage to which she replies, “Bastardi! (Bastards!) You think you can threaten me? I’ll give you NOTHING! You want my children? Take them! I have the instrument to make more!” and then proceeds to flash her lady garments to them. Upon playing this I admit that I thought Ubisoft had finally thrown out the book on historical accuracy entirely but it turns out that this is based on an account of the events from Niccolò Machiavelli himself. Whether or not this legend is true or not, it does indicate the type of woman Caterina Sforza was. She was ruthless, brave, powerful, and challenged the notions of appropriate female behaviour. Beyond this, conversations with Caterina in game explore how she thinks of her husband as a weakling and how she manages to wield such power as a woman. Caterina Sforza is an excellently represented female character with a story that solidly reflects her real story in the past. 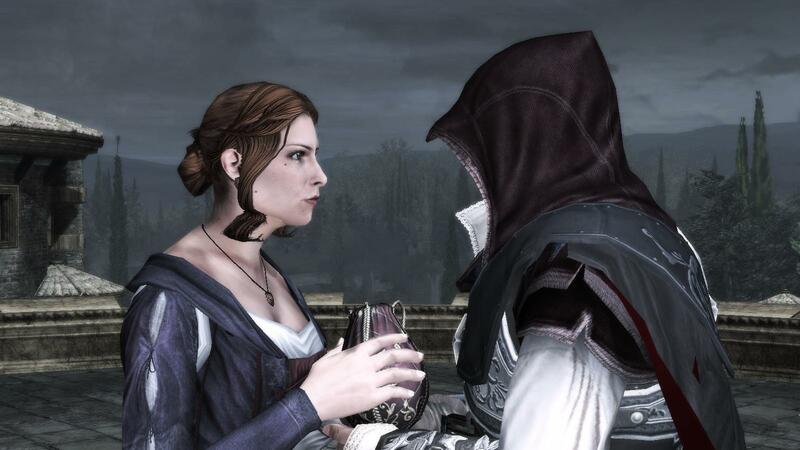 Assassin’s Creed: Revelations and Assassin’s Creed III, like the first instalment of the franchise, have almost no women characters in the story. 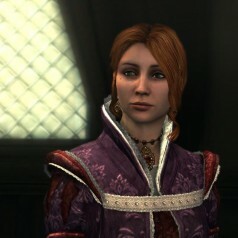 For Revelations, Sofia Sartor acts as a love interest for Ezio Auditore in the twilight of his life. Her character is fun and beautiful but her most important role in the game is when she becomes the stereotypical “Damsel in Distress” and only falls further in love with Ezio after he saves her. As for Connor Kenway’s adventures in Assassin’s Creed III, Kaniehtí:io, Connor’s mother, is a side character during the sort of prologue to Connor’s adventure but due to her premature death, is only part of the game for a couple hours of gameplay. 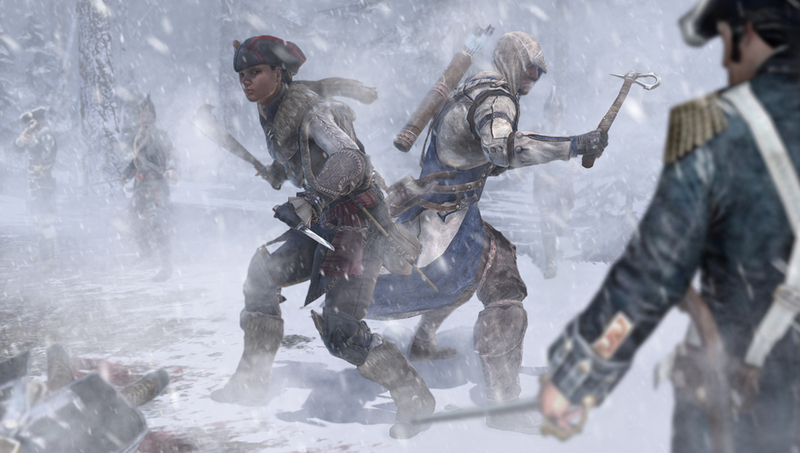 It is unfortunate that Ubisoft could not seem to find important enough female figures from the revolutionary period to include in Assassin’s Creed III. Assassin’s Creed III: Liberation was a spin off title for the Playstation Vita (although it has since been released for PS3) but still was important by including Assassin’s Creed‘s first female protagonist Aveline de Grandpré. Aveline comes from various worlds and the gameplay reflects this. Aveline can disguise herself as a slave or high-class lady to go along with her Assassin gear. These gameplay options are unique to Liberation and are a reflection of how she uses her appearance as a socialite lady as an advantage. It is unlikely that a woman would have managed to obtain so much power at this time period but as is seen with Caterina Sforza and will be seen with Mary Read, women of history have found ways to break beyond the expected female roles. Mary Read is on a personal note probably one of my favourite characters in the whole Assassin’s Creed series. Featured in Assassin’s Creed IV: Black Flag and first introduced as her alias James Kidd, Mary Read was a female pirate in the Golden Age of Piracy. In Black Flag, Mary Read is also an Assassin, who takes on Edward Kenway as a sort of project, hoping to bring recruit him to their cause. She is brash, daring and adventurous but also very wise. In the 1724 book, A General History of the Pyrates, Mary Read’s life as a woman portraying a male pirate is well represented in Black Flag and her role as an Assassin is the game only adds to what is already a very awesome character. Mary Read, much like Caterina Sforza, are strong characters that serve as guides to the player and demand respect for how they act and interact with the world around them. Historically, they are represented quite well and explore some of the ways that women played important roles history. Women of the past are portrayed very well in Assassin’s Creed, even if the women featured already the strongest women of the period. Is it enough though? The harsh truth of video games is that even when they put two steps in the right direction, they always seem to take one step back. Caterina Sforza, Aveline de Grandpré and Mary Read are all fantastic characters but there are still too few featured in the games. In particular, the first Assassin’s Creed, Revelations and III featured nearly no notable women. Meanwhile, the games that have included strong female characters Find ways to reduce them to common fictional stereotypes. 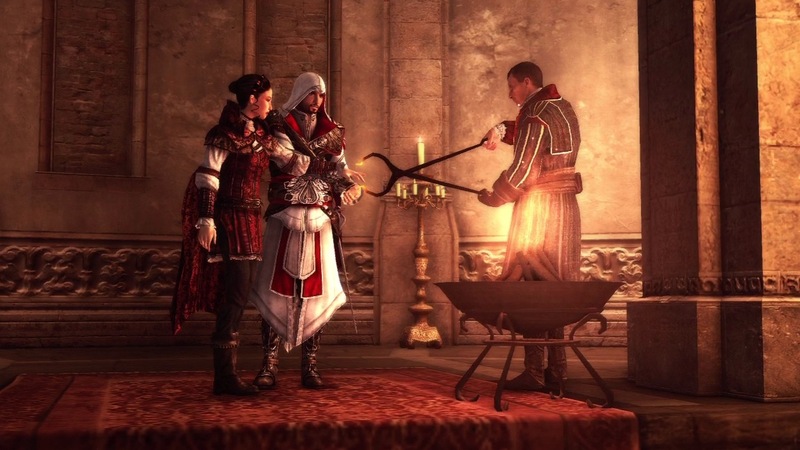 For example, in Assassin’s Creed: Brotherhood, Caterina is captured by the Borgia and imprisoned in Castel Sant’Angelo. Ezio, being the strong male lead, breaks into the castle and in her frail condition, carries her out of her prison much like a husband would carry a wife. Caterina Sforza is one of the strongest women in this era and yet somehow she finds a way to play the role of the damsel, in need of her strong man to save her. Worse off is this is all for the story. Caterina never broke out of Castel Sant’Angelo but was rather freed after more than a year of imprisonment. An eerily similar fate is given to Mary Read. Mary, after being tried and convicted of piracy is held in a prison in Jamaica along with a number of other notable pirates. She is then rescued from her prison by Edward Kenway, unfortunately for Mary she dies on her way out of prison but similarly to Caterina, she is carried out of the prison to be buried at sea. Both Mary Read and Caterina Sforza’s past was manipulated in a way that reduced their status as strong women. Even Aveline when she is aligned with Connor from Assassin’s Creed III for a mission, defers her judgement to him when making decisions and while Claudia never requires saving in Brotherhood, the extended universe novel states that she is kidnapped by the Borgia and rescued by Ezio and Machiavelli during the events of Brotherhood. This is not to necessarily pick on Ubisoft or Assassin’s Creed, as they are doing much more than the rest of the industry (some links contain language NSFW). In fact they are probably one of the leaders in including female characters. However, it still shows the problems that exist in this medium when depicting women. The series’ portrayal of women speaks not to the women of the past, but popular culture’s portrayal of them today. The Assassin’s Creed series shows both how far the medium has come when dealing with women and how it still has work to do. Tomorrow’s post will look at the Grand Narratives behind Assassin’s Creed. Just wanted to say this is a wonderful series with strong research, thought, and fairness. One small piece from ACIII missing above is the portrayal of women, particularly Myriam the huntress, on the homestead. While far out of the main story and very optional, her portrayal is interesting. Conner does rescue her from poachers to start, a lazy damseling, but after that she is shown to be an austere, serious hunter who aims to actively do what women are not expected to. Every homesteader has a story like this–the social justice rogues gallery is kind of humorous–but I found Myriam’s most effective. Her courtship with and marriage to an awkward but sweat french furtrapper becomes the center of the homestead missions. Conner helps the awkward pair find commonality, with his sleuthing revealing Myriam needs a new knife, not flowers. After the courtship (any many months–the game plays with time well), Conner goes to see why Myriam is not there for the wedding. A chase scene commences where she shows real fear and anxiety over losing her freedom in marriage. As far as I remember, Conner helps her see that if she loves Jacque she should know he will not mistreat her and no rights will be taken from her. I’m not sure her being rescued and eventually hitched is groundbreaking, but Ubisoft again chose to confront problems of gender and feminism rather than ignore them, so they get my commendation. Thanks for the kind words. This was a very fun project for me as I love these games and being able to intersect my research with them was great. Your point about Myriam is good. I admittedly had not played Assassin’s Creed III recently leading up into this posting and so only recently when I did replay it I realized that I had omitted her from my post. Myriam is a cool character that as you’ve outlined is beyond the normal role of a woman and her romance with Norris is cool. I’m glad you brought her up because she is one of the stronger female characters that they created even if she only appears in non-mandatory side missions.